This represents a significant annual increase over last year. 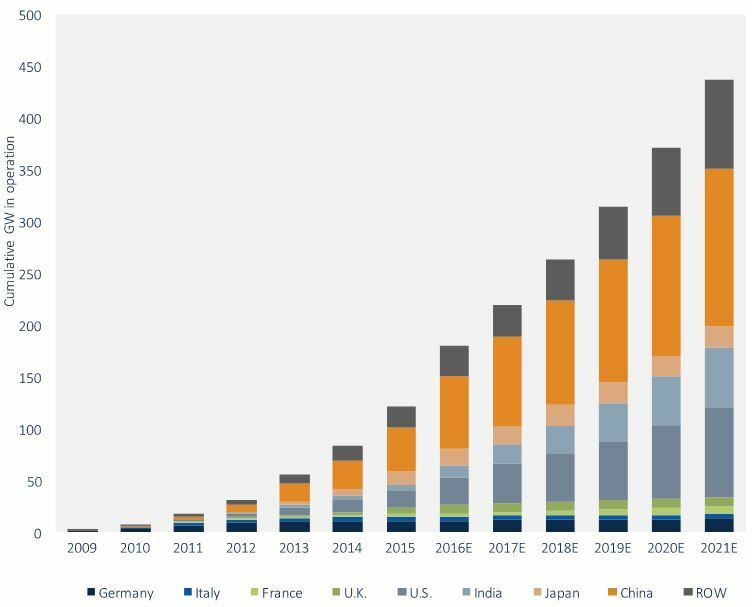 The global addressable market for megawatt-scale PV operations & maintenance (O&M) and asset management will reach 182 gigawatts by the end 2016. According to GTM Research and SoliChamba Consulting’s latest report, Global Megawatt-Scale PV O&M and Asset Management 2016-2021, this represents a 54 percent annual increase in deployments over last year. The report notes that more than half of the addressable market has been deployed in the last two years alone. In fact, only 5 percent of the total global capacity has been operating for more than five years. However, the pace of annual installations is expected to drop in 2017 due to a contraction of the Chinese market. 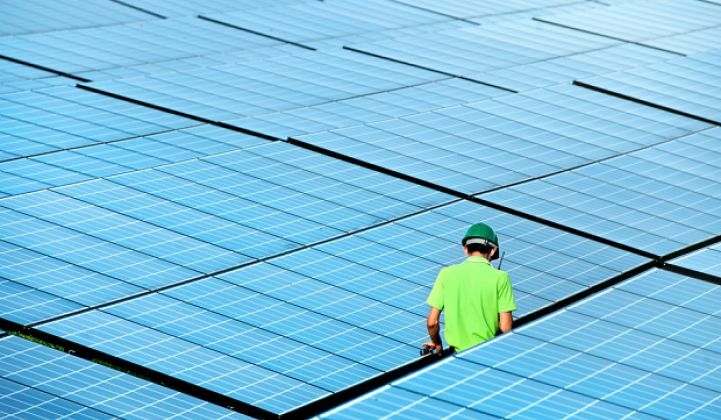 The report estimates that by 2021, China will represent 35 percent of the global installed capacity for megawatt-scale PV plants, followed by the U.S. with 20 percent and India with 13 percent. The report points to an increase in portfolio size as a key trend in the market this year. “New construction markets like the U.S. and India feature large plant sizes and consolidated ownership landscapes that result in very large portfolio sizes,” says Cedric Brehaut, lead author of the report. GTM Research and SoliChamba Consulting note that O&M market vendors are segmented in two distinct buckets: local providers that focus on one key market, and global players that aim to diversify their portfolio not only within one region of the world but also across continents. The largest players today include SOLV, an example of a company focused on one country, and First Solar, a company active across multiple markets. Both firms seek to manage plants built by third parties, thereby following a trend observed across most global markets. 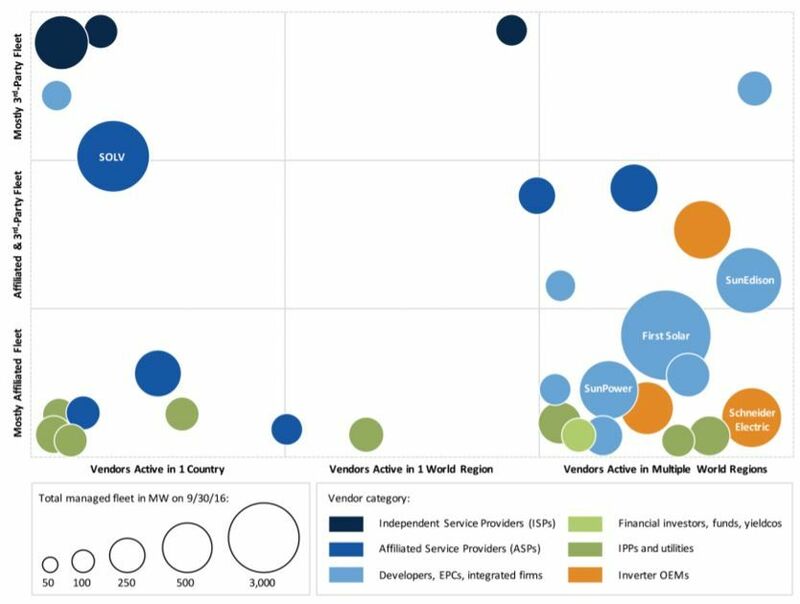 The report profiles 66 companies across 14 markets. According to the report, the global market for asset management and O&M services will reach 501 gigawatts by the end of 2021. Editor’s note: after publication, the global total was changed from 439 gigawatts to 501 gigawatts.